Goldstone is believed to have originated in the 17th century, created by monks who were experimenting with alchemy and, by accident, came up with this beautiful mixture of gold flecks in glass. Venetian glass makers refined the recipe, but they made only brown goldstone, which is glass shimmering with copper flecks. 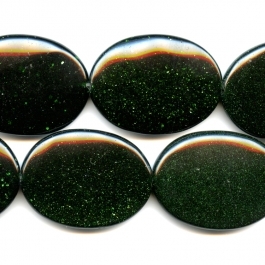 Green goldstone beads take their color from chromium oxides, instead of copper. We've explained more about the history of this striking gem in a blog post called "Gem Profile: Goldstone." Today, this man-made glass is one of the most popular gems in jewelry making. 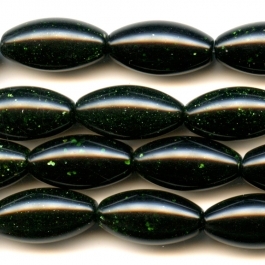 As brilliantly green as a Pacific lagoon, these Green Goldstone beads will highlight and distinguish your own masterpieces. 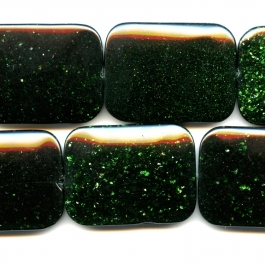 Use these Green Goldstone beads for that unique look you seek in your jewelry making; they would look striking in bangles, necklaces, and more. Be sure to check out our matching goldstone cabochons to go with these sparkling goldstone beads!